Foot care, while not overly exciting, is a crucial part of caring for your diabetes. 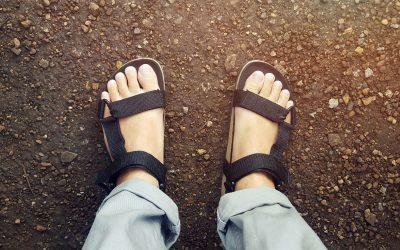 Not caring for your feet can lead to serious problems, such as foot ulcers, infections and even amputation. Fortunately, treating your feet well and managing your diabetes at the same time can greatly lower your risk of developing complications. Let’s get off on the right foot and separate the facts from the fiction when it comes to keeping your feet healthy. Only people who have high blood sugar levels should check their feet. Everyone who has diabetes should get into the habit of checking their feet daily, no matter their HbA1c or blood sugar levels. Looking at your feet every day for cuts, sores, redness and swelling is time well spent to avoid major issues later on. Avoid putting lotion on your feet. Putting a thin layer of unscented lotion, cream or petroleum jelly on the tops and bottoms of your feet after you’ve washed them is actually a good idea. Forgo putting lotion between your toes, though, because that may raise the risk for fungal infections. Avoid soaking your feet if you have diabetes. As soothing as it feels, soaking your feet is a no-no when you have diabetes. Keeping your feet immersed in water can dry out your skin, and dry skin is more prone to cracks, which can literally open the door to fungus and bacteria. Also, if you have any loss of sensation in your feet from nerve damage, you run the risk of a burn from hot water. Getting a pedicure is perfectly fine. Pedicures make your feet look pretty, but they can spell danger if you’re not careful. Before you get your toenails polished, consider the following. If you’re in good health (and that includes your feet) and free of complications, a pedicure poses very little risk. However, if you have any cuts or sores or have neuropathy, skip the trip. Do your homework. Ask questions about the salon’s sanitizing practices. The foot baths should be cleaned and sanitized after each pedicure. Nail tools should be sterilized in an autoclave, and the package shouldn’t be opened until you’re sitting in the chair. Also, avoid salons that use wooden tools or that reuse emery boards. If you bring your own nail tools, make sure you clean them thoroughly when you get home. Go ahead and walk barefoot on the beach. Strolling on the beach is so much better when you can feel the sand between your toes. But unless you’re walking on super-soft sand that’s free of rocks, shells and glass, your best bet is to don a pair of beach shoes or flip-flops. Still insisting on walking barefoot? Keep these tips in mind. Protect your feet if you have any loss of sensation in your feet. You can easily get a pebble or piece of glass embedded in your foot and not feel it. Also, wear beach shoes if the sand is hot. If the beach looks rocky, slip on those beach shoes, even if your diabetes is well-managed. You can still end up cutting your foot or stubbing a toe. Inspect your feet once you get back home and check for the usual cuts, scrapes and redness. A podiatrist (foot doctor) is a key member of your diabetes care team. Your doctor should check your feet at least once a year, if not at every visit. And your job is to check your feet every day (or have someone check them for you). So why might you need to see a podiatrist? If you have warts, corns or calluses on your feet. Say no to bathroom surgery. If you have thickened or yellow toenails. A podiatrist should trim your nails for you. If you can’t see or reach your feet to inspect them. If you have a bunion, hammertoe or any other foot deformity. A podiatrist can help you decide on the best type of treatment and guide you on the right type of shoes to wear, too. If you see a cut or a sore that doesn’t seem to be healing, or if you notice any redness, warmth or swelling. These could all be signs of an infection.